Service is the link between the brand and the customer. To stimulate transactions, the people who represent your brand, be it the person in charge of customer care or the front office receptionist, must be customer-friendly. This book maps out 32 Ps that sum up the universe of a transaction - 'Please-to-Thank you'. Your relationship with your customer will make your brand loved, cherished and sought after. 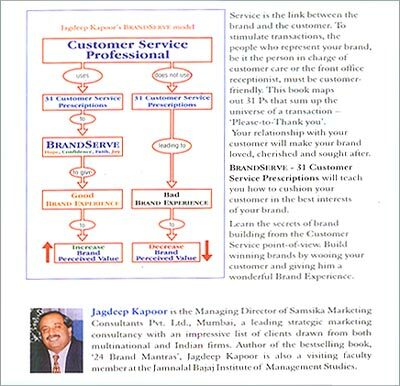 BRANDSERVE - 31 Customer Service Prescriptions will teach you how to cushion your customer in the best interests of your brand. Learn the secrets of brand building from the Customer Service point of view. Build winning brands by wooing your customer and giving him a wonderful Brand Experience.